Note regarding “TOLAC.” When reading from medical texts, remember that you are no longer in the land of emotion and warm fuzzies. Rather, envision that you have been transported to another world, a clinical world, where terms like TOLAC/TOLAMC, or trial of labor after (multiple) cesareans, are used. I don’t think that most care providers understand the emotional sting that many women seeking VBAC associate with the term TOLAC. It’s important for women to understand the language care providers use so that they can translate TOLAC into “planning a VBAC” and not feel slighted. You might want to read this article which describes what the term TOLAC means, how it’s used in medical research, and why it’s not synonymous with VBAC. Who makes a good VBAC/VBAMC candidate? Some have interpreted that silence to mean that ACOG does not recommend VBAMC, yet ACOG is clear that women shouldn’t be forced to have cesareans. Between what they say about VBA2C and who is a good VBAC candidate, we might be able to discern who might be a good VBAMC candidate. Reason for prior cesarean/history of vaginal birth. Research has shown that women who have had cesareans for malpresentation (breech, transverse lie, etc) and/or a history of a prior vaginal delivery would have the highest VBAMC success rates. Scar type. Low transverse incisions (also called bikini cuts) carry the lowest risk of rupture in comparison to classical, high vertical and T/J incisions. With the likely increased risk of uterine rupture in a VBAMC, having low transverse scars is a way to minimize that risk as much as possible. What does ACOG say about VBAC? The preponderance of evidence suggests that most women with one previous cesarean delivery with a low transverse incision are candidates for and should be counseled about VBAC and offered TOLAC. Conversely, those at high risk for complications (eg, those with previous classical or T-incision, prior uterine rupture, or extensive transfundal uterine surgery) and those in whom vaginal delivery is otherwise contraindicated are not generally candidates for planned TOLAC. Individual circumstances must be considered in all cases, and if, for example, a patient who may not otherwise be a candidate for TOLAC presents in advanced labor, the patient and her health care providers may judge it best to proceed with TOLAC. What does ACOG say about VBA2C? Given the overall data, it is reasonable to consider women with two previous low transverse cesarean deliveries to be candidates for TOLAC, and to counsel them based on the combination of other factors that affect their probability of achieving a successful VBAC. Data regarding the risk for women undergoing TOLAC with more than two previous cesarean deliveries are limited (69). How a provider approaches VBAMC depends a lot on their training as well as the support of their hospital administration. In the video below, Dr. Craig Klose discusses the merits of vaginal birth after cesarean and the various factors that may impede women obtaining VBAC. One thing that stood out to me was Dr. Klose’s comments on VBAC after multiple prior low transverse cesareans (LTC). To sum, he says that he was taught that multiple LTCs were “no biggie” and he has attended up to VBA5C. This is the power of training and context! Respect for patient autonomy also argues that even if a center does not offer TOLAC, such a policy cannot be used to force women to have cesarean delivery or to deny care to women in labor who decline to have a repeat cesarean delivery. You may also wish to review your options when encountering a VBAC ban and the story of a mom seeking VBA2C who was threatened with a “forced” cesarean when her OB group withdrew support at 38 weeks. Your best bet is to review your medical records with several VBAC supportive care providers and get their opinion. Obtain a copy of your medical records and operative reports from each prior cesarean, get the names of VBAC supportive providers, and ask the right questions. I have had 4 C-sections. Last one an “Anchor” T. If we get pg again I will VBAC . There is no greater risk compared to C-section without all the drugs, trauma, interference…Godand my body will triumph. I myself have had 4 C-sections now Dr. Vu did let me try vaginal with my last baby but she was breech and they could not get her to turn so I had her via c-section may 14th 2018 he was the only dr I found that would let me try in san diego somebody recommended the ican website and it referred me to him I want another baby and he will let me also try vaginal as long as I wait 1 year before I get pregnant. There is no greater risks involved and is is worth the try. My first son was also breech and then the other doctors would never let me try vaginal until I found Dr. Vu it didn’t work out this time but I will try again. I hope everything works out for you and Good Luck! I have four ceaserian .the first fetal distress .the others once c.s always c.s .now I have three boys .am living in Kenya .East Africa I look fordoctors who support vbac but no one say yes to it even v.b.a1c..even it’s not allowed more than 4 ceaserian here .I refuse to tie tubes after 4th c.s one year ago am in dillemma since I want large family can anyone help pliz.muslima. I am planning a vba3c Imgur May of 2018. I had 2 csections due to fetal distress and 1 due to failed to progress. Do you know anyone at Loma Linda or st Jude who is vba3c friendly? Would appreciate any names. I tried my local ICAN but didn’t get any leads. I read your post on this website and was surprised to read that you are in the same situation I am in. I have had two c sections also, the first due to fetal distress the second due to failed to progress during labor. I am also pregnant and expect my baby by the beginning of april. Unfortunately I cannot help you with your question, since I live in the Netherlands. However I wondered if your doctor recommended you a third c section? Mine has but I want to try a vaginal birth. A c section is recommended after two c sections is the policy in my country. Did you decide to try a vbac yourself or do you have the support of your doctor? How did it go? Were you able to have a vbac? Your best bet is to contact the ICAN of San Diego chapter. They know the lay of the land there! I believe Dr Lac Vu does VBAMCs nearby. I also know of two midwives in birth centers who will do it; one one Fallbrook and one in Riverside. The FB group IcAN in the Inland Empire has more info. Me too! I would love if anybody can tell me if there is dr willing to take me at 39weeks pregnant? I’ve had 4 kids and 3 C-s and 1 Vag and now the 5th I want to try VBAC and my dr didn’t tell me they don’t support VBAC in the hospital And the “hospital” don’t have the equipment Which I don’t think it’s the truth and I live in Chicago ILL If anybody knows plzzzzz let me know thanks! I am going for a vba3c. My first was because I was induced at 40 wks and my dr ruptured my membranes in less than 5 minutes my daughter heart rate decreased & was an emergency csection. My 2nd we did a tolac i made it to 7 cm and baby heart rate decreased I received epidural very early so just laying in the bed & nurses or Dr’s didn’t try alternatives to increase heart rate. 3Rd I wasn’t even given a chance & was clueless to Acog guidelines. I found a supportive dr but my husband is scared of the risk & think I shouldn’t do it. My concern is I never enjoy my birth because I’m always put to sleep. For once I would like to be woke & allow my hubby to cut the cord and be in the room with me. Also I was told by my old dr after I did tolac that a baby can’t fit through my birth canal but yet she allowed me to try is that normal? I think she just said it so i could leave the vbamc talk alone. How can a dr even determine that? Also I am 4″9 243lbs another dr recently told me I am too overweight and would never push out a baby because my fatty tissue will just get in the way what does that mean exactly, could there be truth to what he is saying? I left that office feeling broken and discouraged. Please if you can help me. I hope to hear you speak on Vba3c on 8/26, I am looking forward to seeing you. I hope you are able to come to the event in Louisiana as I believe it will help you achieve clarity on your options. There is a lot to consider when deciding between a fourth cesarean and a VBA3C. Unfortunately, I can’t individually answer all the questions I receive via the website. If you’d like to schedule a time with me to talk one on one, you can do so here. Hi my name is Jeysy I have had 3 c-sections the first was not dilated enough after 2 hours so dr didn’t wanted to wait any longer the other 2 were just repeat I’m currently 28 weeks pregnant and really want to try for a vbacs is there any drs that do it here in San Antonio Texas? Congratulations on your pregnancy! Check out this article to learn more about the various ways you can find a provider in your area. I have 3 kids. My first in 2006 was in active labor for a while she was too big to fit down the birthing canal 9 pound baby girl lol my other 2 kids were repeat c section no issues at all. They were 7 pounds. I want to have a vback on my 4th I am 9 weeks now what do you think? Please advise. I had a failed induction leading to cs in 2009, then a successful vbac in 2010. I had an intrauterine death in 2015 which led to another failed induction and emergency csection in 2015. Both csections in 2009 and 2015 were low transverse cuts with no subsequent complications. I am now (2017) 30 weeks pregnant. I badly want to have a vaginal birth but my Dr insists on a csection. He says it’s because the last csection was done at the thicker part of my uterus at 24 weeks gestation and so the uterus hadn’t had a chance to develop to the point where it would permit a vbac. Yet what I have is basically one scar right on top of the other at my bikini line. So I don’t get why Dr is so bent on a csection for me. Am I putting my life on the line by asking for a vba2c? It sounds like the lower uterine segment was not developed when your 24 week cesarean was performed. What this means is, the cut on your uterus is in the upper part which is associated with higher rates of rupture. This is why your doctor is recommending another cesarean. Whether you want to plan a VBAC is a huge question. And you can only make this decision once you know the facts. There are many things to consider and I, unfortunately, can’t go through them all in this reply. Keep in mind that there are no “right” answers here. Only what is Right For You. That’s because two women can look at the exact same information and make entirely different decisions. There are many things to consider and we each process information and experiences in our own way. Example: 1 in 3 American women are sexual abuse survivors. For some of those women, the sensations of childbirth are triggering and having a repeat cesarean gives them a sense of control. But for other survivors, being numb and disconnected from their body is triggering and so they want an unmedicated vaginal birth because that gives them a sense of control. Again, there is no right or wrong here. Just every pregnant person making the choice that is Right for Them. And the only way you can decide what is Right for You in terms of VBAC is by knowing the facts. That is the only way to navigate the misinformation and confusion and find your path to clarity. This is why I created my online course, “The Truth About VBAC for Families,” because it’s all the information I wish I had when I was considering my options: the real risk of uterine rupture, all about VBAC and repeat cesareans, how to make sense of statistics, hospital birth, home birth, and my legal rights. After I had my cesarean, and I was trying to figure this all out, there was no resource out there that had pulled together all the things that I wanted to know… plus, and this is a big one, all the things I didn’t know I didn’t know that I needed to know. So I had to create it from scratch. Fortunately, you don’t have to reinvent the wheel because I’ve done all the work for you! And if you sign up with two or more friends, you can save 50% off of registration! I’m sorry I can’t answer your question in this reply because there is so much to consider. I am sure you will find the course helpful! Best of luck regardless of what you decide! I am curious about doing a vba3c i had a emergency cesarean with my first because of his cord being wrapped around his neck. My second i just had a scheduled one. By third i scheduled it after the doc told me i couldn’t do vbac. I had the same doctor for all three of them and he has always told me I’m an amazing healer so want sure why he would tell me i couldn’t. Me and my husband want to have 2 more children but it scares me to keep having surgery and risk possibly not even being able to have the second additional child. I live near st. Louis missouri ( Jefferson county really) and was winding if there are any doctors that would be willing to let me try to do a vaginal birth. We are going to start trying little after our son turns 1 year ( getting older so want to have them at a reasonable age to keep up). Any doctors names i can call and discuss it with would be fantastic. There is a mid wife group in St. Louis as well as an obstetrician who will both allow Vba3c. I also would love those midwife or the OB if u can shoot me an email plz. I also had 3C-s and want to do VBAC no matter wat and I’m 39 weeks long and I live in Chicago ILL. I would travel anywhere! Because my doctor waited the last minute to tell me the hospital is not equipped which I don’t believe and also said the hospital don’t support ether so I’m at cross road right now plz any info would help. My name is Lindsay Landsteiner, I’m 26 years old. I’ve been married for almost 10 years. I have 5 beautiful children. Now here comes the part that doctors/midwifes don’t like to hear, all of my children were born by C Section. Not something I wanted, ever. My first daughter was a induction, done before term. I was 18 and was having a hard time emotionally, so my doctor decided to induce. Being so young i just went along with what he said. 12 hours later, an epidural and 2½ hours of pushing, forceps, and the vacuum I was taken into OR, with pelvic displacement. Come to find out later that when I was told to start pushing I was not fully effaced or fully dilated. I was never given a fair chance. All of the rest of my C Sections were done because of the rule “once a c section, always a c section”. I have never had any health issues, pregnant or not. I have had all healthy babies. My C Section cut has been done the same every time, bikini cut. I don’t understand why I can’t be given a chance to give birth to my children. I don’t know what to do. I need information and support. Hi, My name is Kiki and I had 3 C-section but I want to try for a VBA3C sometime next year. I wanted to know is there any doctors in the Savannah,GA area that I can talk to about my decision to try a VBA3C. Its been my desire to give birth naturally and to experience the chance to give birth they way I want. just wanted to know is there a doctor I can visit and speak with about my decision. I just posted your question on my Facebook page which you can view here. Hopefully we will get some replies!! I have had 4 c-sections. All scheduled, no complications. My first was breech. My doctor has said I was stitched up in two layers, and a nurse who assisted in the last surgery went out of her way to come into my room and tell me she couldn’t believe I’d had four sections. All of that said, I was always disappointed that I hadn’t had the opportunity to TOLAC. Would exploring the possibility after 4 sections be unthinkable? One other point to note, I never dilated a single cm or effaced a single %. Even after delivery, I was only a “fingertip.” I’ve never gone through one contraction in my life. It all depends on what you want. There are certainly women who plan VBA4C though it is rare. The hardest part will be finding a provider. As I wrote above, there is an unknown level of risk with that decision. Some women are ok with that, others aren’t. When you say that you never dilated or had one contraction… how many weeks were you when you had your cesareans? In the past, repeat cesareans were sometimes scheduled at 38 weeks. The current recommendations state that no elective inductions or cesareans should occur before 39 weeks. Even if you had your cesarean at 40 weeks, about a third of women go into labor after 40 weeks gestation. My point is, the fact that you never dilated or had a cesarean points to the fact that your cesareans occurred before you went into labor, not that your body is somehow broken or doesn’t work. I had a successful vba3c in 2014 and will soon be having a repeat tolac for baby #6. I never dilated with any of my others but what worked with the last was a gentle induction. I went 2 weeks past my date and was only fingertip dilated, despite having repeat membrane sweeps. On the day of induction they inserted a catheter into my undiluted cervix and inflated it with water. It hurt worse than anything I’ve ever experienced (including that first time getting up after a c-section) but after 24 hours I was dilated to a 4 and it came out with a gentle tug from the doctor. My contractions were helped along with a very low pit drip and my water was manually broken at 7 cm. The doctor told me I had until 7pm that day to get the baby out or I would be sent for a repeat section. I started pushing at 6:50 and had my baby in my arms by 7:05. Don’t let a lack of dilation hold you back from trying a tolac. There are several ways that they can help you dilate, including the catheter or sweep, which are low risk and gentle on an untested cervix and a scarred uterus. This is such a big deal to me. I have had 3 c-sections and in the furture I want to try a vba3c. My doctor said it would be impossible for me to find some one. My first birth was a emergency which wasnt completly explained out to me and i just know i was being wheeled away and being put to sleep. My other two births were elective because i was not fully educated and believed a repeat was the safe option. I have a binki cut line also. After each c-section I had i was up walking around soon after and i got to go home early each time. I believe because of that i could have a successful vba3c. The nurses and my doctor were always amazed by my recovery. My baby is almost 7 months old and i dont plan for another until years from now. I feel robbed about what its like to go in labor and to have part in my babies birth. I would suggest that anyone wanting a VBAC/VBAMC to do your own research in your area to see whats available to you. I had a VERY successful VBA5C in Dec 2010 by Dr. Joseph Tate in Atlanta, GA.
ArLove…congrats on your VBA5C’s. I had my 5th CS about 8 months ago, it was a filed VBAC attempt only because I fell victim to there scar tactics. I would love to hear more about how your VBAC went, you can e-mail me if you like nicole.russell@telus.net I would LOVE to try a VBA5C’s too. Hello Isabella. I had 1 enduced still born vaginally. 2nd baby emergency csection high (up and down) idk how to say it. 3rd was a vbac after cervix was scraped to start labor. 4th emergency csection because of low amniotic fluid. My uterus was T’d. I was told I must have csections only. I had 5 more scheduled csections. My question is is there a chance I could have a VBAMC? Im currently 12 weeks pregnant. I heard of VBA6C. I am looking at having another baby. I have had 3 c sections and want to have a vbac with my fourth child. My first section was because of prolonged labor but my other 2 c section were encouraged because of my first c section. At this point I have gained enough knowledge to know that these so called Baby by appointments were money driven by the hospitals that I have had my children at and no other options were offered to me; such as a vbac. My biggest question is: I am a healthy women age 31 and have had 3 prior c sections with little to no complications am I a good candidate for a vbac birth. Thank you for collecting so much information! I had 3 sections – 1 for distress, the 2nd for not dilating past 8cm, the 3rd (an attempted home birth) because I had symptoms of a UR (a small one, but still an opening) and while baby’s head was visible I could not push him out quickly enough. The doctor said I must have a small pelvic outlet and that I would never be able to have a vaginal birth. So here I am researching – vaginal birth after 3 sections – if there was a rupture in the last birth is this likely to happen again? I can’t bear the thought of another surgical birth, at the same time I need to know that my body can do it (both scar and the pelvis!) if I go for a VBAC next time. What are your thoughts on it? 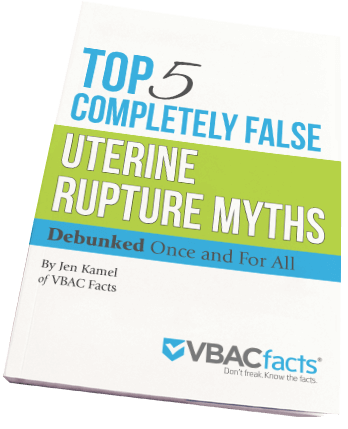 According to ACOG’s 2010 VBAC guidelines, women who have had a uterine rupture are not candidates for VBAC. How should future pregnancies be managed after uterine rupture? If the site of the ruptured scar is confined to the lower segment of the uterus, the rate of repeat rupture or dehiscence in labor is 6% (117). If the scar includes the upper segment of the uterus, the repeat rupture rate has been reported to be as high as 32% (117, 118). Given both these rates, it is recommended that women who have had a previous uterine rupture should give birth by repeat cesarean delivery before the onset of labor. Because spontaneous labor is unpredictable and could occur before the recommended 39 weeks for an elective delivery, earlier delivery should be contemplated with consideration given to amniocentesis to document fetal lung maturity. The uterus is rupturing because something is not quite right: whether that is damage from a prior cesarean, a defect, a fluke or over-stimulation from induction/ augmentation drugs. A uterus will carry the cause (damage, defect, fluke) and the damage of the rupture into the next pregnancy. This weakens the integrity of the uterus and increases the risk for subsequent uterine ruptures. Since the limited evidence indicates a high risk of rupture, it would be unethical to further study it and subject women to this increased risk simply to pinpoint the exact rate of uterine rupture after uterine rupture. Now all that said, you can always review your operative report with a VBAC supportive care provider to determine exactly what happened and get their thoughts. I wanted to let you know that in Jan 2012 I had a very successful VBA3C in Ottawa, CA. I was lucky enough to find a midwife who supported my decision. I recommend everyone do their own research and make an informed decision. I have 5 birth one vaginal, One pushed out while I was made to be put to sleep ,and the last three was c section .Could I try I vbac. I was wondering .every dr i hae been want to do a c section on and they do want me to even try it . You can plan a VBAC, but finding a care provider is the tricky part. I posted your question here so you can get more feedback. Thanks Jen! I am a VBA3C mama (who was NOT a good candidate for TOLAMC, This was my 3rd attempt at VBAC, history of very long labors, FTP and CPD, as well as a sacral fusion and a large fibroid) Thank GOD for my VBAC friendly OB who encouraged and supported me and understands that birth means more than simply the physical process for many of us. If not for him, I would have been under the knife a fourth time, something I surely did not want. Congratulations Abbey and thank you! !